There really is only ONE Question needs answering here- WHAT is wrong with the people of Houston? Home » No Shame » There really is only ONE Question needs answering here- WHAT is wrong with the people of Houston? The question has nothing to do with race or gender it is simply a question of human decency and the lack of it. Of course, her voting record speaks for itself and the fact that she has said some of the dumbest things ever uttered by a human being (“will the Mars rover be driving around to see the flag Neil Armstrong planted?”) notwithstanding, the people in her district ought to be ashamed of themselves for allowing such an indecent human being represent them. It really is quite sad and quite condemning of a majority of a district that someone so rude and so ignorant can be elected eleven times and counting. I’ll tell you what else is sad, it is sad that the House of Representatives has so little respect for itself as an institution that it does nothing to rid itself of such bores. In 2002, the Weekly Standard did a deep dive into her travel demands. The congresswoman, the article noted, lived about ‘200 paces’ from her Cannon Building Capitol Hill office, though still insisted on a ride. On December 6, 2001, a blue Ford Contour with government plates pulled up to her apartment building where it idled for 23 minutes, blocking rush hour traffic in the meantime on one of Capitol Hill’s busiest streets, the Weekly Standard said. When the congresswoman appeared an aide opened the car’s doors for her and waited while Jackson Lee stood outside the automobile to take a phone call. Then an awkward moment ensued when Jackson Lee stared her staffer down until the congresswoman’s jacket and shawl were removed. In a 2011 article in the Daily Caller drivers for the lawmaker said she demanded that they run red lights and on highway shoulders – antics that caused one accident. Jackson Lee was screaming at a staffer to drive faster when the aide turned too sharply and ran the car into a wall, the Daily Caller reported. While her time was precious, staffers’ testified theirs was not. Idling the car so much started to damage its engine. ‘My mechanic friend said, “you know, your car looks like you’ve driven it twice the miles you have,”‘ the staffer said. 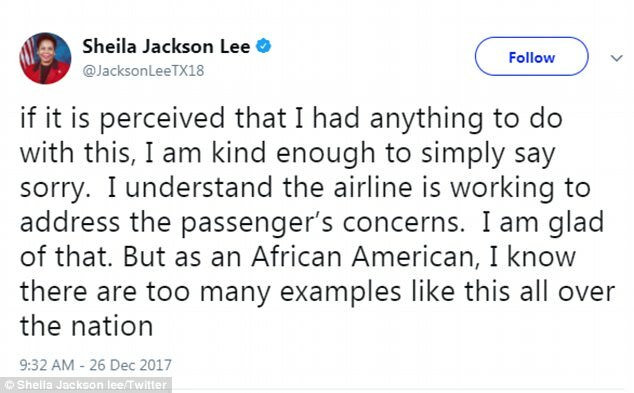 In February 1998, while sitting in first class, Jackson Lee famously berated a flight attendant over her meal choice not being available on the particular plane she chose to fly home on. 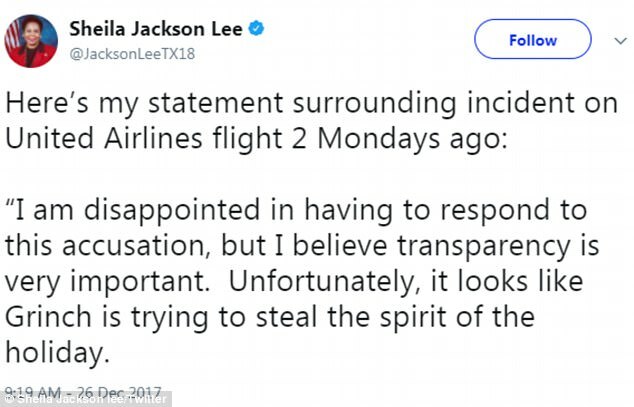 After this incident, the vice president of Continental’s government affairs office called Jackson Lee and warned her that her behavior needed to improve or she would not be flying the airline again, sources told the Weekly Standard. A year later, in May 1999, Jackson Lee had boarded a Continental flight out of Washington, D.C.’s Reagan National only to find that she had misplaced her purse. The congresswoman proceeded to get off the flight to look for the bag back in the terminal, meanwhile the plane had left the gate – with the missing purse on board. According to aviation lobbyists that the Weekly Standard talked to, Jackson Lee demanded she be let back on the plane and didn’t believe it was against Federal Aviation Administration regulation. 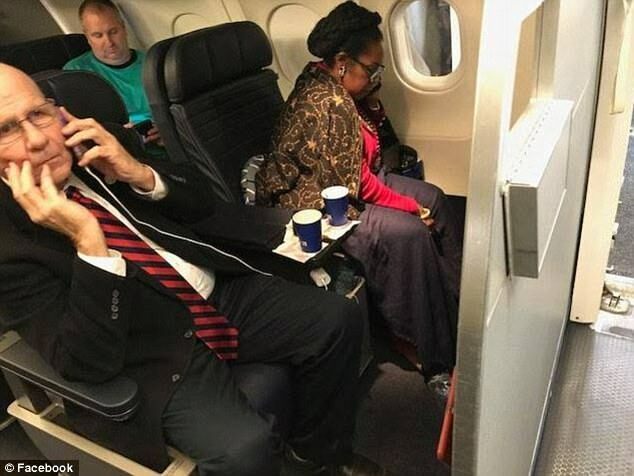 Jackson Lee was put in seat 1A, which was originally paid for by a Jean-Marie Simon, a schoolteacher from Washington DC, who has accused the airline of evicting her from the seat so they could give it to a member of congress. The congresswoman said in a statement Tuesday that she is upset she has to respond to allegations that she demanded special treatment. 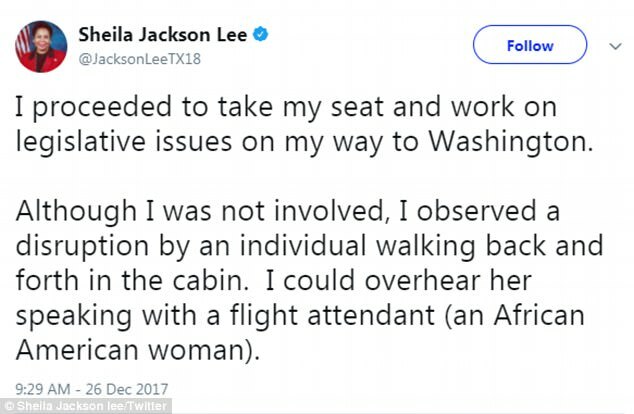 ‘Since this was not any fault of mine, the way the individual continued to act appeared to be, upon reflection, because I was an African American woman, seemingly an easy target along with the African American flight attendant who was very, very nice,’ the 67-year-old Democrat tweeted Tuesday. And on Monday United again apologized to her and said they would reimburse her with a second $500 voucher. ‘I am disappointed in having to respond to this accusation, but I believe transparency is very important. Unfortunately, it looks like Grinch is trying to steal the spirit of the holiday. Last Monday, I arrived at the airport to catch my flight to Washington to continue my fight to get Hurricane Harvey funds back to Texas and other hard hit areas, along with funding of the Children’s Health Insurance Program and of course, trying to stop a tax bill that was going to cause millions of Americans to lose their health insurance. After receiving my boarding pass, I boarded the plane in the normal process. I did nothing wrong. I asked for nothing exceptional or out of the ordinary and received nothing exceptional or out of the ordinary. I proceeded to take my seat and work on legislative issues on my way to Washington. Although I was not involved, I observed a disruption by an individual walking back and forth in the cabin. I could overhear her speaking with a flight attendant (an African American woman). I saw the gate agent go to the seat of the individual who was walking back and forth before we took off. I later came to understand that the individual had canceled her own flight. However I had nothing to do with that. I noted that this individual came toward me and took a picture. I heard later that she might have said “I know who she is.” Since this was not any fault of mine, the way the individual continued to act appeared to be, upon reflection, because I was an African American woman, seemingly an easy target along with the African American flight attendant who was very, very nice. This saddens me, especially at this time of year given all of the things we have to work on to help people. But in the spirit of this season and out of the sincerity of my heart, if it is perceived that I had anything to do with this, I am kind enough to simply say sorry. I understand the airline is working to address the passenger’s concerns. I am glad of that. But as an African American, I know there are too many examples like this all over the nation. Immediately after the incident the airline denied Simon’s claims. ‘After thoroughly examining our electronic records, we found that upon receiving a notification that Flight 788 was delayed due to weather, the customer appears to have canceled her flight from Houston to Washington, DC within the United mobile app,’ United said in a statement. Simon denies the airline’s claim that she canceled her ticket and claims United staff threatened to remove her from the flight for complaining and for taking a photo of Lee in her seat. The teacher said she has screenshots of her United app that shows a canceled flight to Houston in August during Hurricane Harvey when she was supposed to visit her daughter, according to the Houston Chronicle. United says the screenshot wouldn’t show the December 18 flight as canceled because Simon did eventually end up taking the flight. ‘I asked for nothing exceptional or out of the ordinary and received nothing exceptional or out of the ordinary. I proceeded to take my seat and work on legislative issues on my way to Washington,’ she wrote. Simon also said she hopes the airline makes everything right with Simon. But other people on the flight claim they have witnessed the congresswoman carry out similar behavior at least three times before. ‘I’ve seen Lee and IAH cutting in line and rudely taking advantage of her status before. United knows she will play the race card if she isn’t treated like royalty so they just give in. They don’t care about a hard working teacher vs a privileged idiot,’ one person tweeted. Simon has denied all claims that her anger and frustration with United had to do with race. ‘I had no idea who was in my seat when I complained at the gate that my seat had been given to someone else,’ she said. 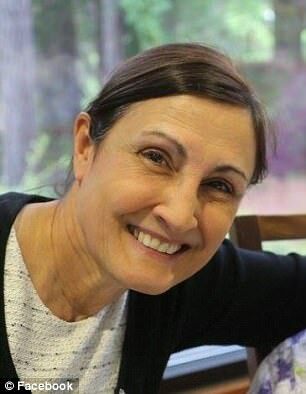 The teacher said she was so distraught by how the airline treated her that after she arrived home she wrote a letter to the CEO, Oscar Munoz, and posted it on social media. An airline representative contacted her last Saturday morning and repeatedly apologized. Simon has asked for a formal, written apology. ‘It’s just impossible to suspend disbelief and swallow that story that I cancelled my flight,’ she said said.